IMEI numbers are a source of both mystery and paranoia within many circles around the Internet. These cryptic, nebulous numbers stamped around various parts of your phone are commonly used to identify phones, leading some to wonder whether they can be used for surveillance and other nefarious activity. We’re here to demystify IMEI numbers and tell you exactly what they are, how they work, and how you can find them. If you know what an IMEI number is and just want to know how to check the IMEI on your phone, you can jump straight to it here. The International Mobile station Equipment Identity number (IMEI) is a number used to identify a device that uses terrestrial cellular networks. “And what is a terrestrial cellular network?” you may ask. This is the network you use when you place a call on your cell phone or access an Internet connection provided by your cellular carrier through your data plan. It’s called “terrestrial” because it uses planet-side antennas, not satellites, to connect. You may have already gathered this, but it’s handy to have a definitive answer to the question. Since the IMEI standard is used for any terrestrial cellular network device, this means that 3G/4G tablets, laptops with PCMCIA wireless Internet cards, and other mobile equipment are also tagged with these numbers. If you have a dual-SIM phone, you’ll see two IMEI numbers, one for each SIM slot. When a carrier knows that a device has been stolen, it can blacklist the IMEI code and lock it out of the network. Later on, it tells other cellular networks to do the same. 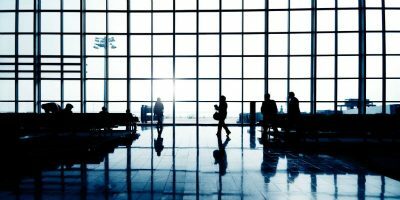 Can the Government Use My IMEI Number to Track Me? Long answer: It depends. If they can’t attach a name or some form of personal identification to your IMEI number, they don’t know who your phone really belongs to. This is often the problem with prepay customers. Since they don’t sign contracts with their wireless carriers, there’s no way to attach a face or ID card to the IMEI number. The process of doing so is tedious at best. If you have a contract with a mobile carrier, the government could use a search warrant to access your IMEI information for number and location tracking. So even if you swap out your SIM card with a prepaid one, you can still be traced. We’ll discuss this at length in another post. Government is not the only entity you should worry about. Hackers can trace you if necessary using your IMEI number. However, neither of these situations happen very often to the average citizen. Do ALL Mobile Devices Have IMEI Numbers? 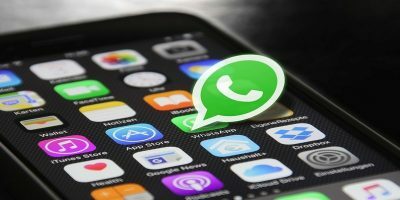 There are also rumors that government agencies around the world use IMEI-less devices to avoid being traced by counter-intelligence black ops. Is My IMEI Number Valid? Some counterfeit phones have bad IMEI numbers. The easiest way to check the validity of an IMEI number manually is by using the Luhn formula for verification of identification codes. If you want an easier way to check your IMEI, there’s always the online checker at IMEI.Info. The fastest method of checking the IMEI number on your phone is to open your keypad and type *#06#. Your IMEI number should pop up on your screen instantly. You won’t be able to copy and paste the number, unfortunately, so you’ll need to write it down separately to keep hold of it. If you’re a bit of a hoarder, then prepare to feel vindicated for holding onto that box your smartphone came in! The IMEI number of a new phone is usually written on the box, possibly on a sticker with the barcode on it. A little more fiddly, but if none of the above methods work, then you may be able to find your IMEI number on your SIM card tray, or if your phone has a removable cover, under the phone battery. The method for checking the IMEI on your iPhone is much the same. Just enter *#06# on your phone keypad, hit the green “Call” button, and your IMEI will appear on the screen. 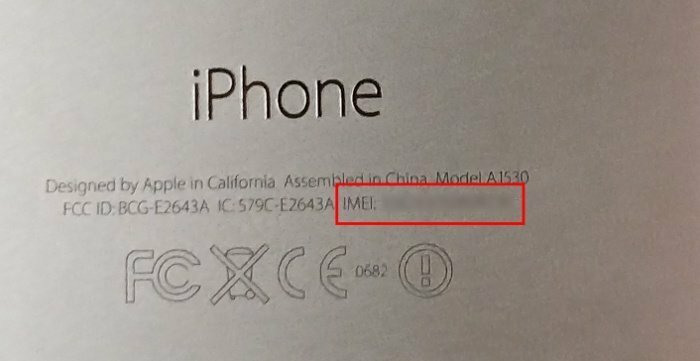 That failing, you can just check your iPhone’s IMEI number by looking on the back of the phone. You’ll find it written in tiny letters under the “iPhone” brand. So now that you have your IMEI, you want to do something with it, right? There are plenty of sites where you can enter your phone’s IMEI number – such as imei.info – and in return you’ll get a list of exact specifications and information about your device. 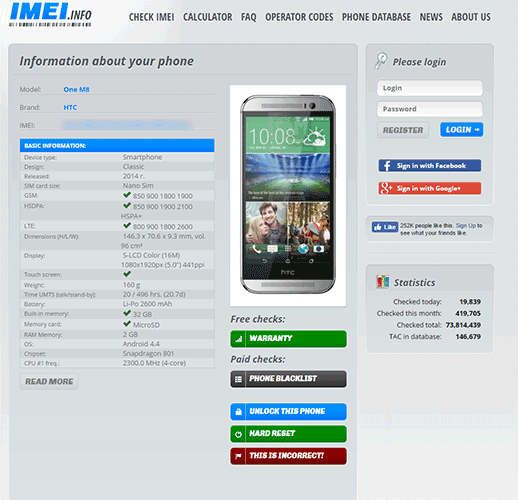 Another site, imeipro.info, lets you use your IMEI number to check whether your phone has been blacklisted/reported as lost or stolen. It’s always good to do if you’re buying a phone secondhand. If there’s anything that has helped us stop thieves in their tracks most effectively, it’s the IMEI standard. While the number could still be used against you, it’s well worth the risk. Please join the discussion by posting a comment below! FYI: I’m appologizing for this rant now! 1.) Your device does not broadcast it’s private IP address while connected to the internet. The local (server) IP address is used. 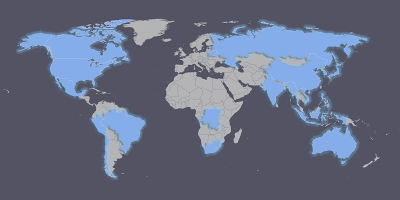 That IP might be useful for a devices approximate location, but not with the local IP alone. A VPN along with Tor can be used to mask your IP from even your ISP. (Using Tor alone is no longer 100% absolutely effective against an elite programmer or developer) 2.) The IMEI alone can be used to track a device. The IP address wouldn’t make it scarier. 3.) Google tracks you! Via Gmaps. Your Gmail password is much easier cracked than the IMEI, & can easily be used to exploit a device’s location. 4.) In most cases a person with the knowledge to figure out a device’s IP from it’s web usage (intercepting packets) has the ability to figure out the device’s IMEI as well. Honestly ppl don’t care about their privacy. As long as they can update their selfies, chat/text/sext, play internet radio through their wireless headphones loud enough to make sure everyone notices them, troll social media to treat depression, & as long as they can suppress their insecurities by sneak searching Wikipedia/Reddit to sound smarter than everyone, they dont care about an IMEI! Right?? This is wonderful information about IMEI numbers. I would recommend my social circles to read it for their knowledge. Keep it up..
how much did google pay u ? Both will be identified as the same phone. It’s unfortunate, but detected quite quickly. Carriers keep tabs on IMEI numbers of the phones that customers buy from them. IF someone know my mobile number can he find the IEMI number of my mobile??? Kindly give me confirm answer with solid reason??? When my imei number comes up it has the 15 numbers with /03 on the end of it wht dose that mean ? But I want to know, is ‘network unlock process’ can change the IMEI number automatically ? I don’t really understand your question. Can you try elaborating? I bought an LG phone with Android OS, when I was doing software update blocked.After all checks I came to the fact that the IMEI number is problematic because it does not have the LG database and searching I found that the IMEI using an old Vodafone cellphone.How solved problem because I do not have reception on the phone? Can one use IMEI number to determine the exact make/model/series of the phone? For example, can one differentiate between Samsung Galaxy 2 from Samsung Duos and/or Samsung Galaxy Pocket using IMEI number only? There isn’t a whole lot a person can do with your IMEI number, except report your phone lost. If your phone was purchased as part of a subscription with your carrier, they will need a form of ID to confirm the report. If it wasn’t, you don’t have anything to worry about, since no one can really report an unlocked phone lost. IMEI tracking is very rare and often done by some government entities. You don’t have much to worry about. 1) Don’t give it away. 2) Don’t download apps from non-trustworthy developers. If I jailbreak my iphone 5 will the IMEI number still help me to track it down or enable me to blacklist the phone if it’s stolen or will it become more difficult to do this. If it’s stolen I would at least be happy knowing that a thief won’t be able to freely use my phone but I’m not sure if this is the case. If you jailbreak your iPhone 5, your IMEI will remain the same. You’ll likely still have the same protection you had when it was tied to your carrier. Your carrier doesn’t have a way of detecting a jailbroken phone from its end, unless you announce the carrier that the phone has been unlocked. Your buyer wants to reassure himself that he’s getting a phone that’s unlocked by verifying the IMEI from a database. There’s nothing wrong with giving him/her the number, since it takes more than having the number to actually hack your phone. I have got a phone off a friend and it won’t allow me to make calls. I found out that it was reported lost. What do I do? Can I change the IMEI number? May be that’s my Iphone. Just do the right thing and take it to the carriers outlet. They’ll trace the owner of the phone. my device a blackberry 9360 was traced as sending an anonymous sms. the sms receiver has traced this sms to my imei number. my device was with me all the time . is there anyway some can change details. the sim that sent the sms shows that my device sent the sms. 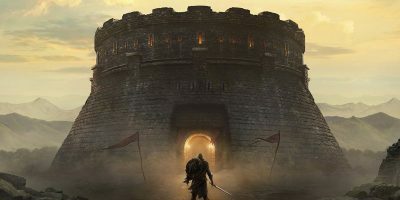 Great article, I’m AWFUL with technology and all this stuff but very helpful! Will be sending on to my circle of friends too for info/interest! Quick question to check though (I’m not great with these things like I said) I’m looking to buy a second hand iphone (I just need a desperate upgrade to what I have plus cant afford the brand new new smartphones!) – am I within my rights to ask to check the imei number in the shop before buying? 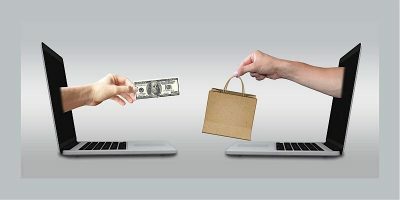 or is it like Ebay and there’s a window to return if not happy/satisfied with product? 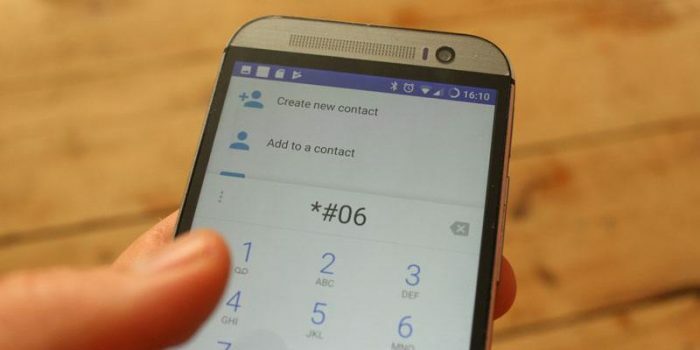 can IMEI number tell if your phone is fake or real? The concerns of people have been perused by me and i found it very informative and useful . 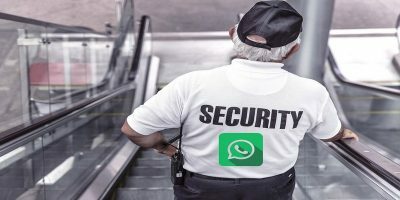 I , want an explicit response as what actions should be undertaken , once the cell phone gets lost by any means , so that it is tracked and same can be received by the owner in shortest possible time. How, to prevent from overwriting or deleting of original IMEI # of the cell phone by the , potential thieves etc . Whats new information you want to share , on the subject matter , Tracking / Tracing of cell phones . More question to follow in due course of time . First off, if someone is tapping your calls, your IMEI is the least of your concerns. Get a new number. Your government has the ability to track you, but with great difficulty if you’re not using a phone issued by your carrier. Also, the only way a person can track your phone through IMEI is if they had access to the carrier’s database itself. I highly doubt this would be possible. On the other hand, someone could theoretically trace you by knowing your phone number. Do you have a dual-SIM phone? 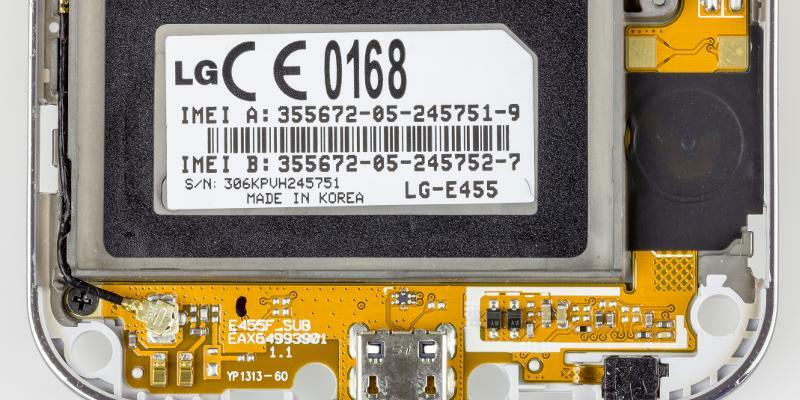 Some phones may have a “/01” and “/02” at the end of the IMEI number to identify each SIM card slot. my provider did not require my imei….. If the phone is factory unlocked and you have only used a prepaid SIM can you get the IMEI from the SIM or phone number attached to the SIM? No you can’t . The only thing you can get is the contact info but that’s about it. I have a question. My mobile was lost. Now is there a way for the thieves to change the motherboard of the mobile which inturn changes the IMEI number? I wanted to understand what part of the hardware is responsible for generating IMEI number? It all depends on the phone. Most Android phones can be hacked easily . If you have Iphone it’s a bit harder to change imei , but motherboard can be changed easy. Can somebody have your imei number changed? 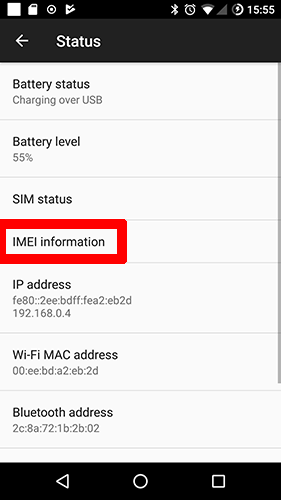 The IMEI is a read-only number in your hardware. It’s hard-wired. I’m not sure if anyone would go through the trouble of changing your IMEI number. Since you are so well aware of the IMEI facts, please clarify that can the IMEI number be changed. My nexus 5 has been stolen, and I just want to know that should I rely on the IMEI number searches or not?? I’m not sure exactly what you’re trying to ask here. Can you somehow elaborate? My HTC desire x is stolen. Can i depend on the carrier and police to trace down my mobile using the IMEI number or can the culprit change the imei by changing the motherboard? And is it legal to change the IMEI numbers of mobile devices? IMEI numbers are useful in that they give carriers a way to mark a device as lost or stolen. The problem with IMEI is that it doesn’t offer a reliable tracking ID. Either way, your phone will be easier to find with an IMEI. Also, don’t sorry so much about the motherboard being changed. I see lots of people commenting with such concerns. Mobile motherboards contain the device’s SoC, which is usually the most expensive part of the device. The motherboard as a whole will cost anywhere from 60-80% of the entire device’s price tag. The usual thief won’t go through so much trouble for such a small return. My SONY Z ULTRA has been stolen. It was having a prepaid connection. Is there any way to track my mobile? Please tell me the specific answers. I’m assuming you’re talking about your Xperia Z Ultra? The only way you’d be able to track the location of your stolen mobile is if you use Android Device Manager. Hopefully, it’s still connected to your Google account, so you can just lock the device and keep tracking its location until you find it. Unfortunately, you can’t track your IMEI number yourself. I assume that some mobile carriers do triangulate handset locations based on the phone number in the SIM card, if you got your phone from your carrier. You should talk to your provider and see if they can do something for you in this respect. can i know how many number of sim cards have been used till yet with a particular imei no. Recently, I have lost my Android phone. I have noted IMEI Nos. I approached Police Station to lodge an FIR but they refused to do so except putting rubber stamp on the application. Even service provider denied to do more except blocking SIM Card. Can anybody please help me what to do to get my mobile back. What are the chances. If they are at all decent, they’d replace your phone with another one of the same or similar model. Instead, some ISPs resort to making you pay for insurance on your phone if you’d like to have this. I’m afraid that in this case there isn’t much you can do. Can anybody get my mobile history like my internet history call logs n messeges if they have my imei number ?? Nope. That could only happen if your carrier has been recording these things and the attacker has access to the carrier database, granted the carrier is associating this information with your IMEI in the first place. hi..i have shared my IMEI# of my broadband stick to a site to help me unlock it..after that, i have successfully unlock it..but my internet speed became slower..?Is there any connection of that? I was discussing with motorola problems my droid was having with automatic updates. One agent, after verifying my phone number, said my phone was corrupted and tried to get me to buy a new phone (supposedly after consulting tier 2 tech support). Upon trying chat after hours, I was advised by level 1 support to do a factory data reset. This was after avoiding giving the agent my IMEI. I told her I did not think she needed it. So we continued and the reset worked, and made updates available. Well, two updates worked, the system version and another, but the third failed. I am still not running Jelly Bean I told the second chat representative the next day. She asked for my IMEI. She told me she needed it to see if my phone was out of date. I told her my android version was and what the failed update code was, but she got pissed and disconnected me. Why do they need the IMEI? The IMEI code can tell them what OS version your phone came installed with. It also gives them other information to ensure that it’s the phone they gave you, not some other phone. Yeah, I gave them the OS version, and my phone number and my email, but tier one still needed my IMEI, even though in the end all three tier one people did not do anything to help me. The last one said he would try to push the update but later said he could not, so I was finally given permission to talk to tire 2, which did push the update. But the fact that the first tier one support person I spoke to (on the phone) said I needed a new phone is what made me suspicious. There is no way I need to spend the 170$ she noted to get a phone because mine was supposedly corrupted and could not be updated. What a crock! The support person I talked to on the phone did verify my phone, so when I talked to chat I was skeptical to give them the IMEI, as I feared they might also say I needed a new phone. Based on the fact that my droid bionic is quit old. Is your phone rooted? In that case, the updates that they push may not install. Nope. But if it was I would probably be able to get the update faster on my own. So I have heard. Yes. Updates come quickly to rooted phones, but there’s no guarantee that you won’t completely brick the phone. Ok, I have left my email address in the system. Now I am looking for some of the Tech guys from the carriers.. I WONT disclose full details, but I am looking for the software which when you type in a mobile number it links into who know where? And lists the imei numbers for the device its being used in and also allows you to locate the device where it is. I am south african and with a law enforcement agency. Cellphone companies wont disclose the name. I have been hinted it is used by C-Track south africa but they deny it. They do have a way… And have help me before. Do you of any such software or databases…. Here in Albania the government is making obligatory the registration of the IMEI. So everyone need to go and register their phone to the authorities, and the nr will be available to 8 government institusions. I dont know if this is legal. I bought blackberry playbook. Not sure if this is original or fake. Imei in the software and the one displayed at the back of the device are the same. When i tried to check the imei in the internet (imei.info) it says that the device is nokia. Is it fake? Or just an error in phone registration in the internet? My phone identifies as a Nokia also (it’s actually a Romanian-brand smartphone). This doesn’t mean anything. It’s just a default fallback when the model cannot be identified. Not all IMEI numbers will have the proper manufacturer in a public database. The only way to truly verify the authenticity of a SIM-based device is to check the carrier’s database if you bought it from a carrier. Otherwise, it’s a bit cumbersome to verify. They’d need to install a malicious app on your phone or have physical access to it. Simply having your IMEI number allows them no such privilege. Hello guys! I have a question about this IMEI number and the risks of giving to someone. I’m kinda newbie at this point. Someone from the support team asked me about my IMEI number to see if i’m connected to their application. 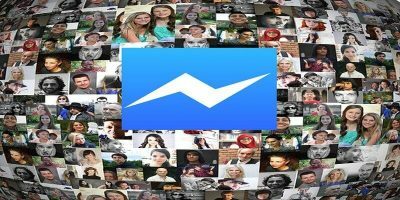 Is it safe to give my number? Is there any risk? Hello, I need help! Last Friday my business iPhone SE was stolen. I learnt now that the IMEI can be changed in minutes with online Youtube instructions. I was relying on the my 6 digit password and on the Find my iPhone APP, but have been told now that this is naive… there is no security and anybody can hack and change a iPhone identity with online instructions. Is this correct info and if yes, would this creature then also have all the business data from my phone?? Excellent. Well written and informative. A pleasure to read. Can anybody use it in overseas? Will it work or no? How i know that someone stolen my imei number nd using my imei number? My sim card company store IMEI numbers for all phones used. However, all last digits of imei are replaced by zero. Does this mean that the last digit is irrelevant? Why change the last digit of IMEI in CDR?. Some peoples said the last digit belonging with SIM or Network?. why this is right?. why to people change the imei no. I’m working for hathway, I must give Attendance through IMEI, how can I escape it? I was recently a victim of id theft. I’m curious how they could have gotten my IMEI in the first place, are IMEI’S attached to messages? if so how. If not what ways could they have gotten it. Perhaps you had an app that turned over your IMEI to the thief; and it could have been a vulnerable app that the thief exploited. Either that or the thief stole your identity beforehand and went to your carrier to get your IMEI. Need help. I bought a device I gave recently to my child with gps/tracking capability) and I complained to the manufacturer that it’s kinda defective because the device’s battery drains very fast. The supposed tech support is asking for the IMEI (of the gps/tracking device of my child) as well as my contact number (not of the device, but of my mobile number, which is attached to the said gps/tracking device). It is also asking me to provide my full name and sort. I have concerns of surrendering those information as those who will have information that i will provide to the tech support might have access to my child’s location logs. The better alternative would be to take the device to the distributor and have them look it over. However, they might already have access to your child’s location log. By buying the GPS device in the first place, you’ve already potentially implicitly trusted a third party with data that’s very personal. Some phone application developers already track your smartphone’s location frequently to find out which places you visited to cater ads to you. This data is sometimes even sold to third parties so that they can use them in their databases. The point I’m making here is that giving over your IMEI to the company will not reveal to them anything they don’t already know. I bought a phone in January 2018 and recorded the IMEI number and after4 months the failed and taking it to the phone repair he says the IMEI number isnt the same . The IMEI number changed drasticallly and the phone could not operate. Whenever a SIM card was placed in the phone it would state that it is not registered and connnection. 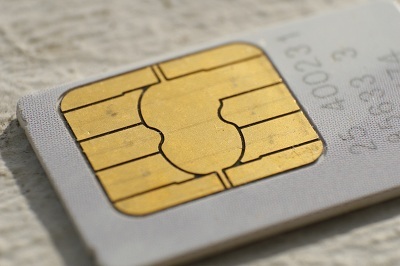 So even if you swap out your SIM card with a prepaid one, you can still be traced. We’ll discuss this at length in another post. This was a very interesting article that helped answer a lot of questions that I had about IMEI numbers. Thank you for breaking this information down and explaining it clearly. I wish there was some sort of rectification process that the IMEI number could be restored. For example, someone buys a second hand phone and finds out the previous owner had an outstanding balance. Say, if you pay 10% of that fee then the IMEI would be cleared. 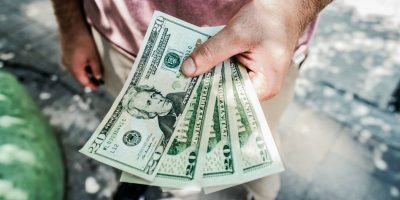 This might help reduce waste prevent both parties from losing all of their money. Can anyone know about my calls text and internet surfing using my imei no. Can imei be used to get internet bundle?